The UN Security Council has declared the outbreak of the Ebola virus in West Africa a "threat to international peace and security". More than 2,600 people have now died in the worst Ebola outbreak on record. Mr Ban said the "gravity and scale of the situation now require a level of international action unprecedented for a health emergency". He announced the establishment of an "emergency UN mission" working with the World Health Organization (WHO) to combat the crisis, saying he would convene a "high-level meeting" next week. The council heard that the international response had to be three times bigger than it was now to contain the crisis - the number of cases is doubling every two weeks in west Africa. The resolution attracted 130 co-sponsors - a UN record - and calls on countries to provide urgent aid, such as medical staff and field hospitals. The resolution also calls for travel bans imposed by some states to be lifted, saying the countries need to have access to aid instead of being isolated. Council members heard that the international response would need to be 20 times greater than it was now, if the outbreak were to be controlled. The Security Council has never previously met to confront a public health crisis, reports the BBC's Nick Bryant from New York. It is only the second time that a public health issue has been addressed at the council, the first instance being HIV/Aids, our correspondent adds. A doctor appearing via video link from Liberia warned that if the international community did not step up its response, "we would be wiped out". Meanwhile officials in Guinea searching for a team of health workers and journalists who went missing while trying to raise awareness of Ebola have found several bodies. A spokesman for Guinea's government said the bodies included those of three journalists in the team. They went missing after being attacked on Tuesday in a village near the southern city of Nzerekore. 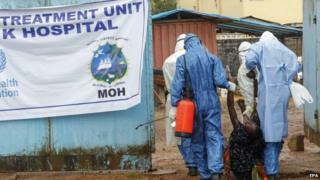 In Sierra Leone a three-day curfew or lockdown intended to stop the spread of the virus has come into effect.